Sarti beach Halkidiki: Located 77 km south east of Poligiros, on the eastern side of the Sithonia peninsula. It has come out as one of the top holiday destinations in Halkidiki, with its magnificent curving coves and white sandy beaches. Sarti is a coastal village which is located on the southeast side of the Sithonia peninsula, about 140 km away from Thessaloniki. It is named after the ancient city of Sarte or Sarti that stood in this area in the classical period. There are still some remnants of a reinforcement and of the old town south of Sarti towards the direction of Sykia, which is situated at 10 kilometer distance. Why eventually the old town was destroyed or abandoned is unknown. Developed around 1922 when immigrants from Asia Minor settled here as immigrants because of the Turkish-Greek war. Nowadays Sarti is one of the main holiday destinations in Sithonia. There is a beautiful view of the Athos peninsula. Besides the main beach there are several smaller bays in the area. The bay in which the village is situated is 2,5 kilometers long. On the main beach with its white sand and green-blue waters you can rent sunbeds and umbrellas. There is also a possibility for water skiing or windsurfing. The beaches are surrounded by an extended forest area. Tourism has therefore become the main branch of industry here. Sarti is located in an area that is well suited for walks. You can climb up the Itanos mountain or walk along the coast and explore the various small bays. In these bays there are usually nice small beaches. The many trees in the area provide you with some shade during your walks. From Sarti there are also excursion boats that sail around the Athos peninsula, where you can get a proper view of some of the monasteries that stand here. There is plenty of choice of restaurants and all the amenities you expect in a tourist destination can be found in Sarti. The range of accommodation in varied and good and most of them are small and family run, as you would prefer in Greece. There is also a camping in Sarti. Across the bay, visitors can enjoy the spectacular views of the Mount Athos, the largest monastic community in Greece. The small homonymous village of Sarti belongs to the municipality of Toroni and it is located between the summer resorts of Vourvourou and Sykia. There are plenty of options for day trips to Athos and the secluded beaches of Sithonia. Accommodation options in the village are plentiful and the facilities are almost as good as in any cosmopolitan resort. The seaside promenade is equally busy. 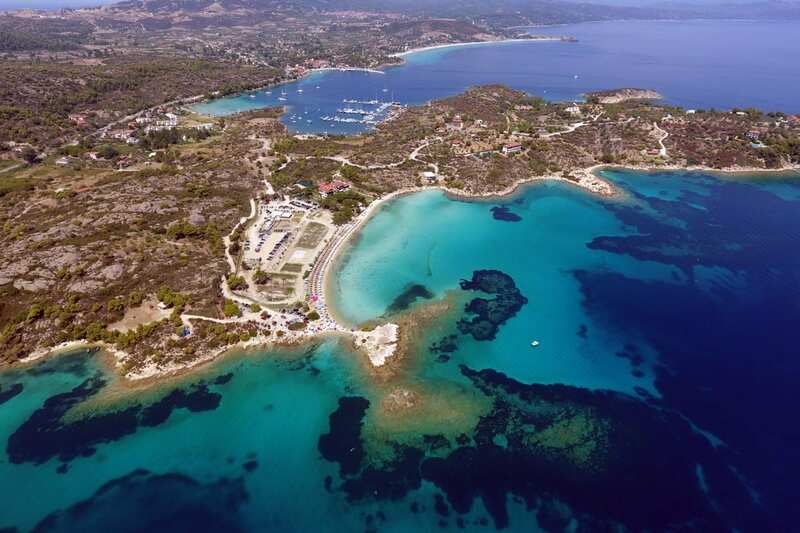 The bay of Sarti also offers camping grounds close to magnificent beaches with crystal clear waters and these come with a choice of tourist facilities. During the month of August, tourists can join the villagers of Sarti in celebrating the religious festival of Virgin Mary, on August 15th. Beach in Sarti is spacious, with beautiful tiny pebble and easily reachable through neat and organized streets. It stretches along entire place, and the surrounding is rich with true little natural jems – beautiful small inlets and beaches surrounded by woods. Beside an excellent beach in Sarti, very close are Achlada, Sikia and Orange beaches which are considered to be one of the most beautiful in Greece. The beach offers a mesmerizing view of the Holy Mountain bay and the tops of mount Athos. Here, waves are sometimes really huge and then swimming is highly not recommended to not-so-good swimmers and children. The climate is quite dry and nights are very warm, meaning that warm clothes are not necessary even in September evenings.